They're light, incredibly strong and they look super cool. Bell Canoes highest-grade composite is something they call BlackGold™ and it is the finest canoe laminate available. The Rob Roy 15 particularly caught our eye. What a sweet ride ! But are Georgians ready for $3100 canoes ? Well, we'll see. We are very pleased to announce that we are now a dealer for Fluid Kayaks of South Africa. 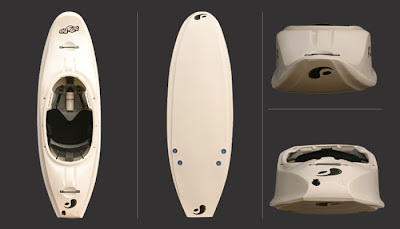 We will be adding the Fluid Element to our surf boat livery and keeping it in stock for our on-line store. Real wave surfing is possible in this WW/surf kayak crossover boat. It also has great wave playing characteristics and should appeal to a broad range of paddling and surfing styles, but namely the white water crowd at the beach. Surf the ocean, shred the the river, rip it up at the WW park. And at only $900 makes for a great #3 or #4 boat. "The Element is shorter than a traditional surf kayak, which gives up a little bit of speed , but the shorter length makes the Element very maneuverable. Super quick directional changes is the name of the game." If you want to throw down some moves this is the boat. It's also the boat to give yourself a good spanking in. Great for 20mph windswell days on Tybee. We are impressed with the quality and value for money of Fluid Kayaks and will be adding more boats to our inventory over time. Occupation: Owner of The McIntosh Company, an oyster retailer named for its location on the western edge of the McIntosh community in Liberty County. Why do you specifically want to sell Georgia oysters ? "I’ve sold Texas, Louisiana and a few Alabama oysters and there’s no question about it – Georgia and South Carolina oysters are the best. Florida are second-best. What makes Georgia oysters so good ? "I guess it’s the marshes. That’s what I’ve always thought. We have much higher tides and marsh grass. The (oysters) here are hand-picked when the tides go out. In Texas and Louisiana, they’re dredged, and in Florida, they’re taken with tongs." "Slow getting the word out. We’ve gotta get a sign out. But we’ve sold some. This time next year, I anticipate being able to sell gallons or pints. Maybe this season, but not likely. How much do your oysters cost ? $25 for a half bushel and $45 for a bushel. A bushel usually contains about 60 pounds. How many people will a bushel feed? "Two bushels will do a nice party of six to eight couples if they’re polite eaters. Some folks I know, two people could eat a bushel, but I won’t call ’em by name." They say oysters can be dangerous. Why? "Oysters can carry viruses and diseases if they’re not properly handled after coming out of the water. I recommend never eating a raw oyster. I recommend cooking them. I used to eat them raw, but I quit approximately 10 years ago because of water pollution." If you get oysters from a reliable source and cook them, there’s very little danger. I don’t think there’s a tastier treat that comes out of the ocean." What’s your favorite part of the job ? "Meeting customers and doing the selling. Danny Eller goes into the river for the most part. He’s just starting to teach me what goes on in the water." What’s your least favorite part of the job? "Probably figuring out the red tape of getting here over about 20 years of time. The hopes and disappointments have been equally mixed. This is a dream that’s been over 25 years in the making, and I’m as happy and proud of it as I’ve ever been." Failure to use the restroom facilities prior to your program may prove troublesome once we have launched. Thank you, Ian and Rick, for the colorful demonstration. 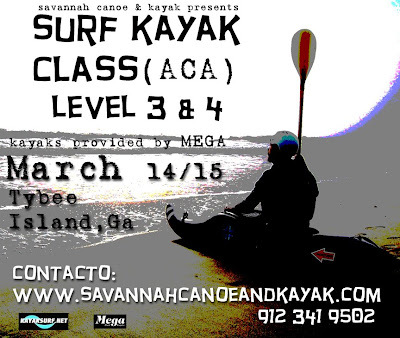 Two days, two classes for surf specific, enclosed cockpit boats only. L3 -Position and take off - Bottom turns - Cutbacks- nuts and bolts. L4 -Posture and trim - Running - Slashing - Off the lip - style and flair. Must have a roll - bottom rolls and sand rolls welcome. Boats provided-plastic and some composite. Reservations now. 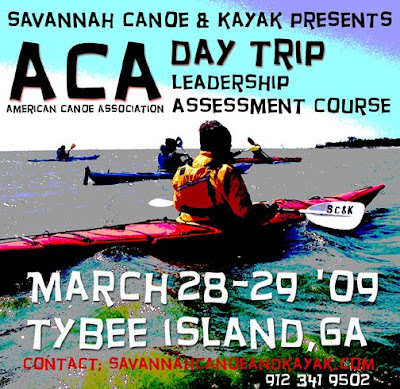 This is an ACA training and certification for those interested in leading others on kayak trips in the coastal environment. Also a prerequisite for guides seeking employment with SC&K. 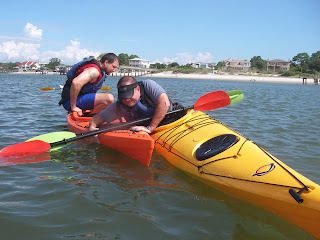 Come and see what is involved in being a day tripping kayak guide. It's a short paddle to a far away beach on a wilderness island. Walk the beach, watch the sun go down, collect some drift wood. Eat grilled shrimp and veggies under the starry sky. Listen to the surf wash over the shore. Sleep soundly. Wake to the smell of fresh coffee. Paddle back through the marsh to the real world. Looking like giant leaves floating in the sea, thousands of Golden Rays are seen here gathering off the coast of Mexico . The spectacular scene was captured as the magnificent creatures made one of their biannual mass migrations to more agreeable waters for feeding. Gliding silently beneath the waves, they turned vast areas of blue water to gold off the northern tip of the Yucatan Peninsula . Measuring up to 7ft from wing-tip to wing-tip, Golden rays are also more prosaically known as cow nose rays. The population in the Gulf of Mexico migrates, in schools of as many as 10,000, clockwise from western Florida to the Yucatan . They migrate twice yearly: north in late spring (as pictured here) and south in late autumn. 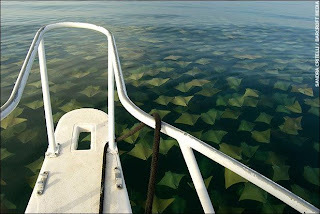 A large school of stingrays is called a 'fever'. SC&K's Customer of the Year, Martha H, pushes past man, alligator, and mulberry bush to take first place in her category during Sunday's Wakulla River Race in St. Mark's, FL. "It was like every competitive fiber in my being was screaming to come out of dormancy, and I loved it! I feel so alive!" It was promptly decided that Martha better return home and spend the rest of the afternoon in quiet meditation to balance out her inflated pleasure of beating others. 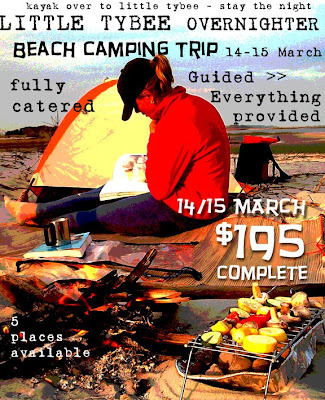 Start the paddling season with something very awesome. 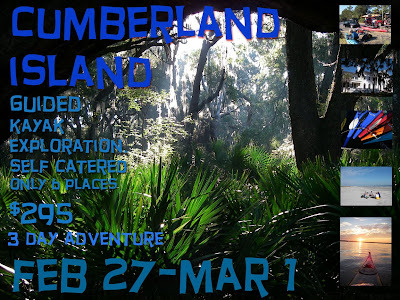 Cumberland Island is the jewel of the Southeast. Riot Kayaks operations continue as closure of Voodoo Technologies Inc. leaves investors and vendors $1.18 million in unpaid bills. Riot Kayaks parent company Voodoo Technologies has closed its doors, leaving about 68 creditors unpaid and debts totalling $1.183 million dollars. Riot Kayaks founder and president Jeff Rivest had previously moved Riot operations and production overseas, leaving just a skeletal staff at the Montreal office. The Montreal office has since closed. Key creditors left unpaid by Voodoo include the National Bank of Canada, $447,833, the Development Bank of Canada, $90,976, and RESO, a Montreal-based capital development fund, at $37,000. Because some of the government funding is secured, other creditors and investors are unlikely to see any money returned, with some in the high five figures. Many were likely surprised that the debt lies with Voodoo Technologies and not Riot Kayaks, which is still continuing to operate from overseas. The Riot web presence (www.teamriotkayaks.com) includes a recent redesign and daily updates, with no reference as of Feb. 8 to the bankruptcy or its change in operational status. The Global Pagoda is to be inaugurated by the President of India on February 8, 2009 at Gorai near Essel World, Mumbai. About 3000 invited dignitaries including the Governor and Chief Minister of Maharashtra, Union Ministers, business leaders, film personalities, leaders of various religions and so forth are expected to attend the event. The Pagoda can accommodate 8000 meditators. pubbakarita, which is, initiative to help others without expecting anything in return. These two qualities are the true yardstick of measuring progress on the path of Dhamma of any person devoted to Dhamma. Gratitude is more important of the two qualities. Whenever we remember the help given to us by any person and generate gratitude towards him, we naturally feel inclined to give selfless service to live up to that ideal. Thus selfless service is strengthened. Gratitude and selfless service complement and support each other. The Global Pagoda will be an expression of our gratitude: towards the Buddha, who as the Bodhisatta strived for incalculable aeons to fulfill his paramis to reach Supreme Enlightenment. Having done so, he taught the Dhamma for the good of many, for benefit of many, out of compassion for all beings. May all Beings be happy, peacful, liberated. For more information on Pagodas click here. The Next Big Nothing...Of Course ! Stand Up Paddle board Fishing... of course ! Everybody's doing it. Great fun for all the family. Followed by.... Stand Up Paddle board Whitewater Fly Fishing... for people blessed with multiple appendages. Thanks for all your suggestions...someone will receive a free gift. Normal operations will be resumed soon. Maybe it's the cold weather and the mid winter blues. Maybe it is the lack of winter surf, lack of paddling and physical exercise. But I got to tell you , I've just about had as much as I can take with the SUP hype. Just when we thought the 'paddle industry' had out done itself with pushing kayak fishing down our throats, along come paddle boards...only 50 years behind their original conception ! The funniest video we saw this week was a guy shooting rapids on his stand up board....we can only think it must of been a rep. So what's next ?... Well, the obvious would be a tandem SUP...Yeah! Squirt boat scuba diving ? A free t shirt to anyone who comes up with the next big 'hype'. 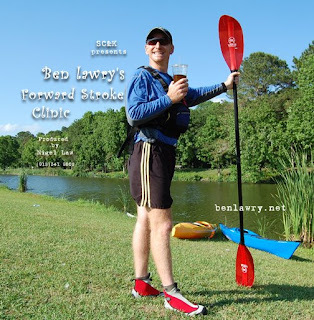 The Forward Stroke DVD is now in shops everywhere. We have copies available for $20 a pop, and the two disc set for $30...that is Rolling Elixir and Forward Stroke DVDs. To purchase a copy of this video.. click here. The film will premier here on the 19th Feb @ 6:30pm. If you want a free copy just drop us a line and tell us why you think this DVD will help you. First entry received wins!